The Arena Naţională got built on the site of Romania’s previous national stadium, Stadionul Naţional Lia Manoliu, which closed its doors in 2007. Construction of the new stadium began in 2008, and, with several delays, was completed in 2011. During the building works it was decided to equip the stadium with a retractable roof. 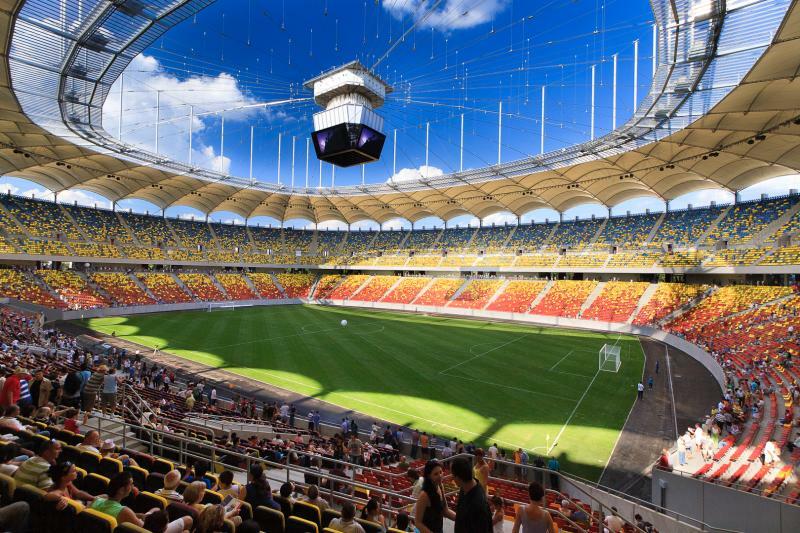 The Arena Nationala officially opened on 6 September 2011 with the Euro-qualifier between Romania and France (0-0). The stadium is owned by the city of Bucharest, but can be rented by any football club. From the start of the 2012/13 season, Dinamo decided to play all their home league matches at the stadium, though scheduling issues may at times force them back to their traditional home, Stadionul Dinamo. The Arena Nationala was initially also used by FC Steaua for high-profile league games and all their European games, and in 2015 they decided to play all their home games at the stadium. The stadium is furthermore the standard playing venue of the Romanian national team. 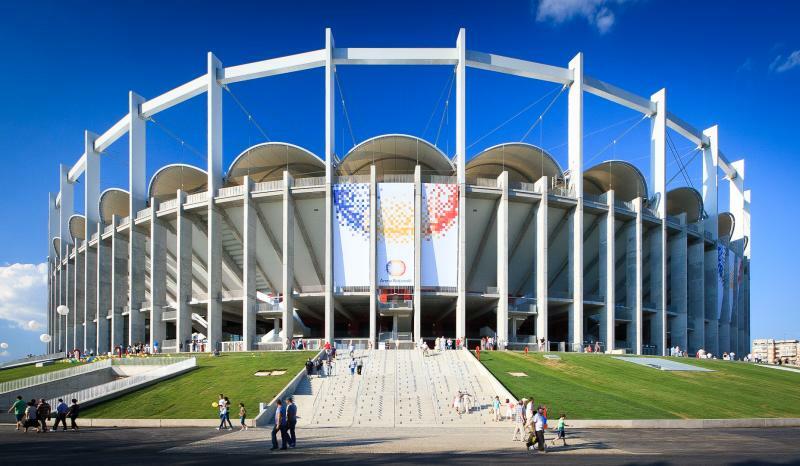 In 2012, the Arena Nationala hosted the Europa League final between Atletico Madrid and Club Athletic (3-0). It has furthermore been selected as one of the playing venues of the 2020 European Championships, which are played across Europe. The Arena Naţională is located in the east of Bucharest at slightly more than 4 kilometres from the city centre. Bucharest’s main railway station (Gara de Nord), which lies north-west of the centre, is about 7 kilometres away from the stadium. The stadium lies a 15-minute walk away from metro station Piaţa Muncii, which is on the (semi-)circular M1 line. Take the metro from Gara de Nord in the direction of Dristor 2. From the centre, for example station Piaţa Unirii or Izvor, a change at Distror 2 station is needed. Alternatively, you can catch trolleybus 86 or 90. Bus 86 stops at the main railway station and runs along Bd. Dacia (north of the centre). Bus 90 passes over Bd. Regina Elisabeta and Bd. Carol I right through the city centre. One can also take tram 40 or 54 from Piaţa Sfânta Vineri (just east of Piaţa Unirii). Both trams pass right by the stadium. Another option is to take bus 104 from Piaţa Unirii. In all cases your stop is Stadionul Național. The Arena Naţionala is located in a mainly residential area. There are a few places to eat or drink around the park on Bd. Basarabia south of the stadium, but in general it will likely be a better idea to do this in Bucharest’s city centre. There are no hotels directly near the Arena Naţională, but a few options at walking distance near Piaţa Muncii metro station. The Golden Tulip Times Hotel is the most upscale option, whereas Hotel Byblov and Hotel Bliss Confort are more basic, and therefore cheaper options. Click here for more hotels near the Arena Naţională. Of course, staying in central Bucharest is almost just as easy, for example near the old town, Piaţa Romana or the Gara de Nord railway station. Tickets for FC Dinamo matches can be bought online, by phone +40 0752 121 159, or in person at the ticket windows of Stadionul Dinamo or the Arena Nationala in the days before the match. Dinamo only sells tickets for the bottom tier of the stadium. Prices typically range from RON 15.00 for a seat behind the goal to RON 70.00 for a central seat at the main stand. Tickets for the other side go for RON 25.00 and RON 40.00. Prices are increased for a few high-profile matches. Tickets for Steaua games can be bought online, or at the tickets windows of the Arena Nationala. Ticket prices can depend on the opponent, but expect to pay from RON 15.00 for a seat behind the goal to RON 100.00 for a central seat at the main stand. Tickets for the other side cost either RON 35.00 or RON 60.00. Steauafc.com – Official website of FC Steaua Bucuresti. Fcdinamo.ro – Official website of FC Dinamo Bucuresti. Nab.ro – Official website of the Arena Naţională. Romaniatourism.com – Tourism information for the city of Bucharest. Metrorex.ro – Information on the Bucharest metro. Ratb.ro – Bucharest public transport information. I went to watch a game between Romania and Poland last month. The stadium itself is very nice and easy to get to with metro station being just outside. Security measures are terrible. It took us about 45 minutes to get through security. They allowed small groups of about 50 people to go and before they reached the stadium another groups had to wait . You are not allowed any coins, battery banks, lighters inside. You can leave cameras and external batteries in a small room and collect it after the game. You get a ticket that you have to return in order to get your items back. All coins are taken away by security guards. Overall nice ground and I would really come back there maybe for a league game of Steaua. Very nice stadium. Modern and big. I went to watch Romania against Poland yesterday. Going through security is a horrible experience. They allowed a small groups of around 150 people to get through a number of checks( 5 if I remember well) before letting the next group go. You are not allowed to bring coins, lighters, lipsticks, phone chargers, cameras and all sort of stuff into the stadium. Coins and lighters are thrown away. The rest you can leave in a small locker room( you will be given a ticket, that you have to bring back after the game to get your items back). Once inside the stadium you will be impressed. Romanian supporters did a really nice display. 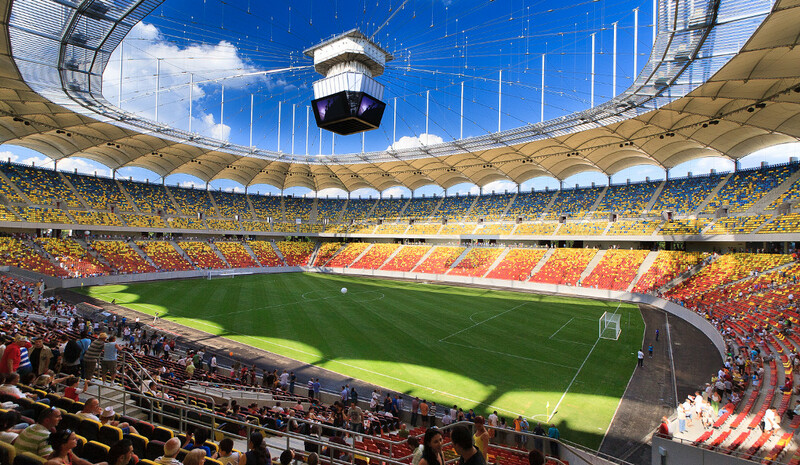 Bucharest is a city worth going to so treat yourself to a game at Arena Nationala. Coming back after the game is another nightmare. Taxis are the best options but with so many supporters willing to take them it is not the easiest task to find one. The stadium belongs to the Romanian Football Team, but sometimes Dinamo Bucharest and Steaua Bucharest play on it. But it belongs to the National Team.